What did the Sun ever do for us? The Sun. It’s that great big ball of fire in the sky. But what did it ever do for us? At the simplest level the Sun gives us light and warmth. As humans this is what we need to survive. It provides us with day and night as it lights up the day side of the Earth, leaving the shadowed side exposed to the depths of space. Light is important to us as Humans as we use it to see our way around the Earth going about our day to day lives, without it we would be in permanent darkness. But how much light does the Sun give off? It burns through a lot of material every second (see fact #2 below) and this generates 3.9×10^26 watts of light which is quite a bit more than your average household lamp. This light is given off in all directions and only a small fraction of it reaches Earth, as the Earth is tiny in comparison to the Sun. However, we are at just the right distance from the Sun so that the light is not too blinding or full of radiation to be terminally harmful to life on Earth. Plant life uses Sun light to generate its own energy in a process called photosynthesis, which in turn gives us vegetation, plants, trees and grass. Plant life then releases oxygen into the atmosphere which we Humans breathe and use as a source of energy to keep us alive. Without the Sun life on Earth would be significantly different from what we see around us today. The Sun’s warmth allows water to remain liquid at temperatures that are suitable for life to exist on Earth. In fact liquid water is considered to be a key requirement in the formation of early life and was the host for Cyanobacteria, which floated on the vast oceans and turned carbon dioxide into oxygen through photosynthesis about 4 billion years ago. We Humans are very approximately 60% water and it is vital to our survival. We use it for all sorts of purposes besides staying alive including, cooking, cleaning, heating, cooling, growing plants and keeping aquatic pets. None of this would be possible without the Sun’s heat. 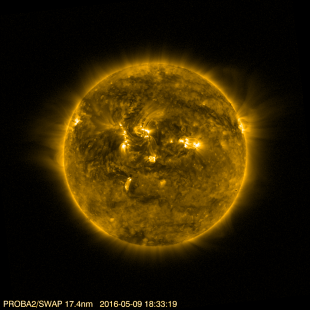 Because the Sun is so huge (see fact #1 below) it also provides the gravitational attraction to keep us in its orbit. This is what keeps us in our position around the Sun, just far enough away not boil off the water and turn us into a giant ball of rock and dust, but just close enough not to freeze all the water and turn us into a giant snowball. This is called the habitable zone around the Sun and we are in just the right place to keep us alive. If there was no Sun we would be floating in the depths of space, completely dark and lifeless covered in ice and snow, so the next time you look up at the Sun remember, it made you what you are today. 1) The Sun makes up 99% of the mass of our solar system. Yes, that’s right 99%. If you added all the other planets and moons, comets, asteroids, rocks, dust and icy bits together you would make up the other 1%. The Sun’s mass is 1.99×10^30 kg, or 1,990,000,000,000,000,000,000,000,000,000 kg. The Earth is just 5.97×10^24 kg, a measly 0.000003% of the Sun. 2) The Sun burns through 600 million metric tons (600,000,000,000 kg) of fuel a second. That is a huge amount of fuel and it has been going for approximately 4.56 billion years and has another 6 billion years left to go. Just take a moment to get your head around those figures. 3) It takes the light in the core of the Sun about 170,000 years to reach the surface but only 8 minutes to reach Earth. There is so much activity going on in the core of the sun that the light keeps bumping into other atoms as it tries to escape, however, there is nothing to impede its journey to Earth. 4) The surface of the Sun has a temperature of about 5,800 kelvins (K) but the chromosphere, the gas just above the surface of the Sun has a temperature of 25,000K. 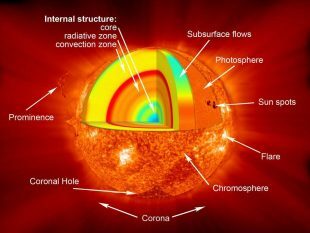 The chromosphere is heated by the energy release when the incredibly intense magnetic field lines in the Sun draw hot plasma from the sun into the chromosphere. The magnetic field lines snap and reconnect releasing a huge amount of energy into the chromosphere heating it up. 5) Sunspots are colder spots on the Sun’s surface that appear dark in photographs taken on Earth. Typically they are approximately 4,300K in the centre but they can be bigger than Earth in size. The sunspots increase and decrease in number over an 11 year cycle with the last peak in numbers being in 2013. Read more on Chris' blog, here and here. An introduction to David Southwood. HAVING JUST READ THIS ARTICLE ON THE SUN. I FEEL LIKE A NONENTITY ON OUR PLANET EARTH. QUOTING LOUIS ARMSTRONGS TUNE, ALL I CAN SAY IS "WHAT A WONDERFUL WORLD". The Sun also provides power via solar energy panels. If only the world could free itself of its addiciton to oil and spend much more on solar energy, we would have a cleaner and less troubled world. However the Sun can also be deadly. One X rated Solar flare can potentially wipe us all out or knock out our communciation systems sending us back to the stone age, or at best relying on telegraphs and morse code. Or carrier pigeons!